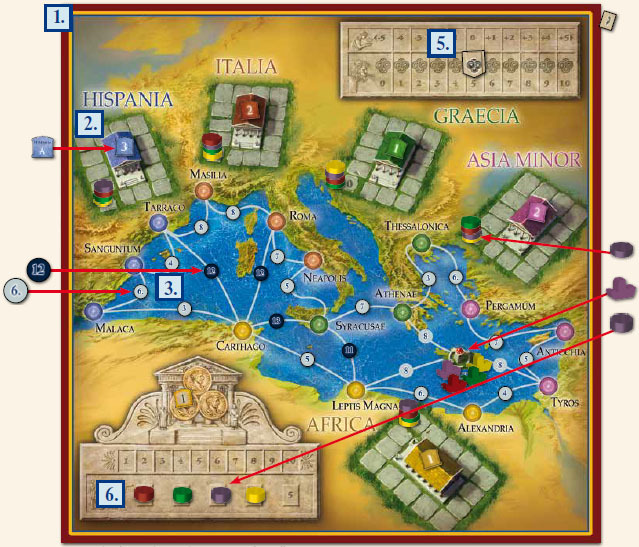 Dirk Henn was probably the first designer that I followed as Alhambra was one of the first euro board games I played and then I found I really liked his next games, such as Eketorp, Colonia, Shogun and Timbuktu. Over recent years, I’ve been disappointed that his games have been re-themes or re-releases of his previous designs; however, this year sees the release of a completely new game called Neptun which looks like a simple eurogame but with interesting game mechanics and a Roman merchant theme. The game lasts 3 game rounds and each game round consists of 5 rounds of acquiring contracts followed by 5 rounds of fulfilling contracts. Cards are laid out in a grid with one row for each type of card (city cards, goods cards and oar cards) and one more column than the number of players. On their turn, a player takes 1 column of cards (one card of each type); however, there’s a neat game mechanic here to make things trickier.